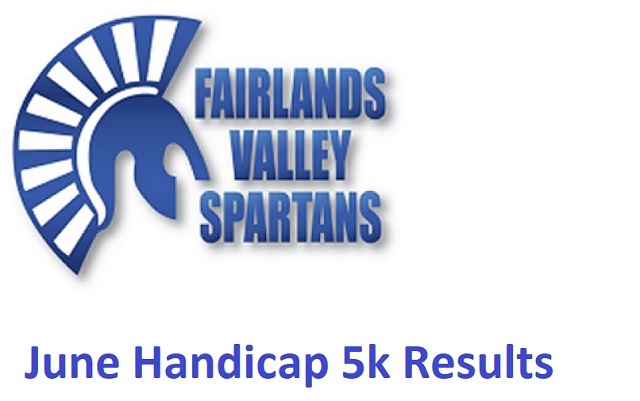 Thankfully the rain stayed away just long enough for tonight’s welcome return of the Handicap 5k. 30 finishers from 31 starters. I hope that Lisa Smith’s hamstring recovers quickly. Many thanks to Cathy Craig for her assistance with the start and finish. Winner was Linda Nolan, a massive 8½ minutes ahead of handicap in a PB time of 27:29. Ryan Dunning finished first man in 23:50, just ahead of Ken Jude in a year best time of 23:25 and with newcomer Josh Massey 3rd man in 23:53. Alexandra Whitehouse finished 2nd lady (5th overall) in a new PB time of 29:19, with Lauren Deighton 3rd lady in a PB time of 23:50. Fastest runner on the night was Steve Green in 19:47, 3 seconds quicker than Stuart Haycroft 19:50, with Liam Herbert 20:08 3rd quickest. Fastest lady was Hannah Neale in a new PB of 22:32, with Lauren Deighton (23:50) 2nd quickest and Susan McAneny 24:57 PB 3rd fastest. There were also PB’s for David Quicke, Mark Collins, Andy Reeve, Alice Burleigh, Emma Poulter and Julia White, a new Season Best time for Steve Gough and Year Bests for Vishal Shah, Lisa Gray, Bernadette Millwood, Simon Sypula, Jon Sypula, Andy Smith and Jordan Quicke. Time between 2nd-29th finishers was just 3:52 and 73% of finishers were within 1 minute of their adjusted handicap. The next handicap will be in 4 weeks time on the 6th July. Thanks to Paul Holgate for hosting.